Fine stuff. Easy to make, and keeps for ages. And, in the Boys Own bumper book of Adventure that is my imagination, it gives endless and massive culinary kudos to the maker. The basics are simple. I went with the cooking for engineers ratio (great site, good article, and they have a great discussion afterwards, for those of a perversely detailed and fiendishly occult bend of mind like my own). It's a simple salt and sugar cure, dry, with dill providing the flavour backbone. Other additions can and do include fennel, white or black pepper, juniper berries, olive oil, lemon or orange peel, and alcohol - gin, vodka, koskenkorva, and whiskey are all mused - this would be amazing with a smoky or lightly peated scotch. Enough dill to completely cover the flesh of the fish. I used the tail end of a whole farmed salmon, coming in at 250g, trimmed. flesh against the grain to feel for pinbones, and use a needlenose pliers to take them out. To make the bones even more obvious, bend the fillet backwards while doing this). To descale, use a knife, and scrape the scales off, again, against the grain. Lay your fillets out, flesh side up, on cling film large enough to wrap around the entire fillet several times. Mix the salt, sugar and pepper thoroughly, and pour over the fillets. Liberally pour on enough dill to completely cover the fillets, and then wrap tightly in cling film. Tear off another strip of film, enough to go round twice more, and wrap it tightly again. Put in a non reactive container - with a lip, the fish will lose water, and form a brine. Leave in the fridge for 4 days. Some recipes call for weighing the fish down, either with a brick on top, or tinned food. 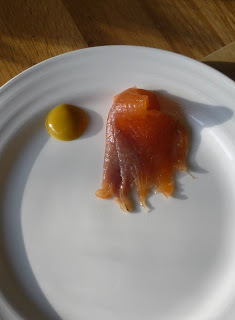 I got quite a firm fleshed and dry Gravadlax without weighing it. One for experimentation, I should think. It's ready when firm to the touch at the thickest part. Unwrap it (after a few hours, if you want a light cure, 4 days if you want a complete cure), wash and dry it, and serve. This is raw fish. Raw. So it's important to freeze it a -25 C for five days to kill any parasites. It's not a good dish if you're pregnant, ill, very old or young. This cure, and curing time gave a quite salty taste. Next time, I'll lower either the salt content, or curing time. The texture is perfect, and the dryness is evident - this cure should keep the fish for a week or two. 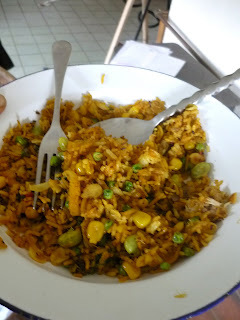 Posted by Keith at 10:31 a.m.
Pictured - kedgeree, or at least a form thereof, reheated in a break from gutting the new house. Freezing fog, zero insulation, single glazing, and wide open doors make this spicy Indian dish a perfect winter warmer. The new house will make posting....intermittent. Lots of work to do, but Autumn should see posts on recipes to cope with the expected fruit glut - we have three established orchards to cope with - and hopefully a stack of posts on building raised beds, and mushroom cultivation in the outbuildings will follow. Poly tunnels the next year, and, fingers crossed, a nice fat baconer fattening up in our stables. But, for the moment, kedgeree. Originally an Indian dish, to which the Imperials added smokies, it is now often referred to as Anglo-Indian, though the Scots insist they brought it with them in the 1700's. It's typically cooked with milk, or cream, or butter, and with flaked haddock,and was served as part of the early morning banquet breakfasts, truly, unbelievably epic repasts the colonial administration had served to them for their 5am starts (William Dalrymple in his book on the so called Indian Mutiny, The Last Mughal, lists a typical breakfast repast as including cold and curried meats, eggs, kedgeree, fruits and nuts, porridge, bacon, game.....). Several recipes call for cooking the rice in a spiced milk mixture, or frying it in butter, then boiling, or adding cream, milk, or butter to the finished dish, or, more commonly, poaching the haddock in milk. All insist on haddock, though the dish speaks to me of leftovers, innovation, and a larder based make-do ethos. I am constitutionally incapable of coping with the English predilection for combining rice and milk. Creamed rice is a tinned abomination best used with which to execute it's inventor. And haddock always reminds me of TinTin. Boil your basmati, and set aside to cool. Refrigerate for four hours. Grind your masala in a pestle and mortar, and then add to a pan or wok, of generous proportions. Dry roast your spices in the pan for a few minutes, and then add oil, and, when the oil is hot, add the onion, and cook gently until soft. Add the rice, from the fridge, and heat thoroughly, stirring occasionally. The long refigeration should give you rice that is entirely unsticky. Add all the vegetables, and taste for seasoning. This is highly subjective, but, as a rough guide, I often add more salt, black pepper, turmeric, and storebought curry mix. Cook until the veg has heated through, and add the mackerel, flaked almonds and sultanas. Cook for another minute or two on a low heat, stirring - to heat the sultanas, and mackerel. Plate up, and add the eggs, lemon zest, coriander and spring onions to each plate. Posted by Keith at 6:05 p.m. It reaches right in and warms the soul. On a sub zero day, it's the kind of dish that locks the doors, lights the fire, and sets out a pair of pre-warmed slippers next to the paper and a glass of what cures you. The spiciness, the deep umami of long braised lamb, the thick flavourful sauce. It really is something a little bit special. And it is braising, which means, with planning, no more than 20 minutes work for a lamb shank masterpiece. Jesus. I almost came over all Delia there "your whole family will thank you for it...."
I originally whipped up an alpha version for the teachers from work, as a recession busting celebration of all things Moore Street, only to realise FX Buckleys charged me €6.50 a shank - same price as Fallon and Byrne's offerings. My local craft butcher, however, advertises the same cuts for €2.50 a piece. The recipe is also highly adaptable - it's easy to substitute other ingredients that are in your store cupboard, or stretch the dish to accommodate extra mouths. With adaptability, there's food for 8 people to be had for under €15. 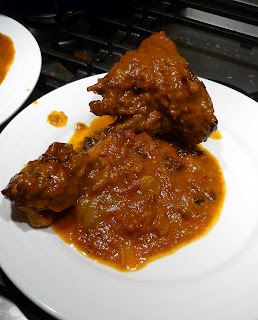 The version posted here is tested and tweaked, especially with regard to thickening the sauce. Let's cut to the meat. These quantities will easily serve 6. If you need to serve more, you may need to take the meat off the bone, and serve it stew style. 1 (or two, if you need to stretch the pot) tins of tomatoes. 1 tbsp of harissa (available in tubes for €1.50 from the Asia market off Georges street. Behind the arcade. The last aisle, furthest from the exit, near the bottom of the aisle). The harissa, unless you make your own, is, I think, irreplaceable. The dish is not what it could be without it. a large cube of peeled ginger. I go for around an inch of root here. Preheat the oven to 140 C/Gas Mark 3. Brown the shanks with oil in a dutch oven or cocotte. Or any oven proof dish with a lid that can do both hobtop and oven service (we picked up a Dunnes deal for €20 on cast iron ceramic pots). Failing that, the entire thing can be made in a thick bottomed pot on the hob. Remove the shanks, and gently fry your onions for 5 minutes. They mustn't brown. Add you ground spices, and gently fry for a further minute. The kitchen will begin to fill with amazing aromas. The three hour cooking time allows the smells to waft everywhere in the house, whetting appetites to a frenzy.....And the smell will perfume every corner of your house. Add everything, except the dried fruit to the pot, and bring back just to the boil. It is of prime importance that the meat does not get too hot. If it does, you will wind up with tough, inedible meat. Keep the temperature low, and the meat falls apart on the plate. As soon as it boils, turn down the heat if you are leaving it on the hob. Cover, and place in the centre of your oven for 2 hours 30 minutes, or, place on a low heat on the hob top for the same time. Occasionally turn the meat in the sauce. What you want here is a low simmer, the occasional bubble rising lethargically to the surface. Remove from the oven, or hob top, add the dried fruits, and cook, uncovered, for a further 20 or thirty minutes. Braises are a forgiving art, thankfully, and not an exacting science. Remove the bay leaves, and cinnamon bark. A typical issue with braises, however well done, is that they produce really flavourful sauces, which are as thin as water. Profoundly frustrating to have so much lusciousness just trickle off your spoon thinly. The sauce has little chance to reduce, because of being covered, and the necessity for low cooking temperatures. And this dish really needs a sticky, glutinous, thick and clingy blanket of the fantastic braising sauce. Most thickeners on hand in the average kitchen will dull the sauce. Starch is a sin here. Ladle out a pile of the liquid (roughly half to two thirds), and some of the fruit and onions (try to leave at least half of each still whole in the dish), and blend them to a puree consistency. Mix this back in with the meat and remaining liquid in the sauce. Works perfectly, and delivers an undiluted kick of North African heat and flavour, which sticks to the meat, and soaks up wholesale into the grains you serve it with. Serve with couscous, or rice, or a tabouleh. Be careful with harissa. It can have quite a pungent chilli heat, and can overwhelm the dish easily. The version for sale in the Asia market is quite hot. I replaced the dried fruits most recently with large sultanas, and raisins, which worked well, and at a fraction of the cost of apricots and dates. I've also tried this recipe with a whole chicken, to excellent effect (Note to self - would pork belly braise well in this?, unsalted hocks? pork shoulder? a slow cook cut of beef? Mutton would be amazing.....), and have cooked the entire dish - enough for 6 hungry mouths - at just under a tenner, all told. Pureeing some of the sauce really improves the dish. Often, there's a thick and ample remainder of sauce left in the bottom of the pot. Perfect as a base for a spicy vegetable or lentil soup, though, with enough heads and bread, that may not be a possibility. On heat and braising. Slow and low means luscious and sweet. There is no shortcut here. The in ital browning does, however, give you those yummy little Maillard reactions, while leaving the bulk of the meat unaffected. Ooo maaaa meee. Posted by Keith at 10:51 p.m. I took posession, late in the last year of a box of alchemical culinary tricks from France. Pipettes, calcium chloride, and the bould sodium alginate, for ravioli and caviar, a syringe, for roasting fowls, filling chocolates and eggs and, inevitably, the diabetes my sweet and sugar addiction is nicely nursing. (I wonder what insulin actually tastes like). I also ordered some methyl cellulose, inspired by this post on the Playing with fire and water food blog. Great photos, engaging experimentation, beautiful food and challenging recipes, including this one for methyl cellulose marshmallows. Worth a number of visits. For non dairy animal free types, the methyll cellulose is plant derived, giving an entriely vegan marshmallow. It's a straight forward, easy to make recipe, taken directly from the above site, and a good introduction, for me at least, to the chemistry of cooking. Weights, including for water, are in grammes. Boil up the water and sugar. Let it cool, and add the methylcellulose and vanilla. Blend them thoroughly with a stick blender. Remove from the fridge. 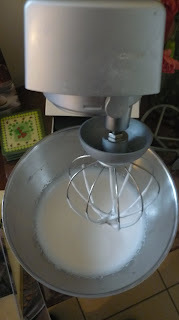 Add to your mixer, or blender, and beat on high until fluffy (it took about four minutes in the faithful Kenwood). Spread the mix out in a mold or on a tray - it doesn't seem to rise too much, and holds it's shape quite well - and pop it in the oven for about 5 minutes, until set. The texture I found to be lighter than classic marshmallow - not as gelatinous, gloopy, or chewable. On the plus side, the vanilla flavour came through more cleanly (no flour/starch to emblanden it?) and the texture had a delicious lightness, much more foamy than I was used to. It also behaves like marshmallow when toasted, browning and crisping up on the exterior. Unfortunately, instead of using it, I left it out, and when I returned, it had leaked out a lot of clear liquid - presumably the emulsion coming apart - and was left with a toughish plasticised skin. One of the properties of methylcellulose is that it gels at higher temperatures, and becomes liquid as it cools. It will hold it's shape for circa 15 minutes, before liquifying. Solution, hold it in a low oven until ready to serve. Posted by Keith at 9:09 p.m. The official, and jealously guarded recipe for a Tarte Tatin is here (I particularly admire their admonishment, in bright red capital letters that any Tarte Tatin ordered with cream or flambeed is "AN IMPROPER USAGE OF THE NAME"). I shall plunge recklessly on, and, risking a gallic cold shoulder to this humble blog, submit this worthwhile and delicious adaptation for your delight. I hope that neither Tatin sister, Caroline nor Stephanie, would overly object. One can only hope that the Lichonneux Brotherhood tasked with the noble tarts defence are not currently in a position to send assassins. This recipe, quick, simple, and quite foolproof, is culled from Sophie Grigsons "Vegetables",a simple, straightforward guide to cooking and selecting them. It's a common sense guide for the everyday cook, with some simple, and some complex ideas for preparation. And a snip at €6 in the post Christmas sales. 15 quid on Amazon though.... A no nonsense book. And I mean that in the best way. First the pastry. Mix the flour and butter together with your fingertips in a bowl, until the consistency is of fine breadcrumbs. Stir in everything except the egg to this mix. 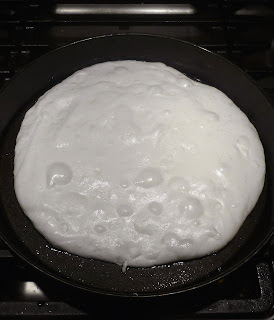 Make a well in the flour, and break the egg into it. Mix the whole lot together with your fingers. The dough will start as a really sticky mix. Mix it until it's soft, but not sticky, adding just enough ice water to bind it. Grigson added 1 tablespoon to hers. I added none - the egg I had was enough. Wrap in clingfilm, and chill for 30 minutes. Preheat the oven to Gas Mark 4/180 C.
Grab a ten inch cast iron pan (I used an 8 inch, meaning things were a little packed in), cut your butter into very thin slivers, and lay them on the base. Scatter the sugar, some salt, pepper and the sugar over the butter. Pack the shallots into the pan, flat side down, in circles, one circle inside the other. I found things got a little more chaotic than that in practice. Shallots are not uniform sized things. Drizzle the shallots with the orange juice and vinegar. Set the pan over a gentle heat, so the butter bubbles up over the shallots, and keep at a gentle simmer for about 20/25 minutes, to caramelise the sugar. You want the juices to thicken to a thick syrup. Her instructions here were spot on - yielding a juicy, yet still quite set tart, that held it's shape perfectly. Take off the heat. Roll out your pastry on a lightly floured board, to just larger than the pan rim. I found a circular breadboard of the same size and used that to roll on. Lay the pastry over your tart, tucking the edges down and into the sides of the pan. The tart centre puffed up quite noticeably here. Transfer to the oven until the pastry browns - 25/30 minutes. Slide it out, let it cool for two or three minutes, run a knife around the edges to loosen it, and then cover the pan with a serving dish. Flip the whole lot upside down - it will be very heavy, and you'll hear the tart dropping onto the plate. Any pieces of shallot stuck to the pan can be eased off and put back in to the tatins glazed jigsaw. Eh voila. 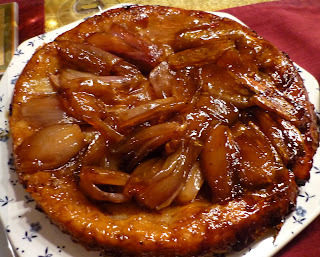 Shallot upside down tart. Served up happily to the nosh crazed vegetarians at the Christmas day table. Honour is satisfied. And the Tatin sisters are surely smiling. The tart also works in pear, tomato (including green tomato), rhubarb, figs, plum, beetroot and a variety of other fruits and vegetables. Beetroot? Beetroot? I think I might have to side with the Brotherhoos od the Tart on that one. Raspberry Tatin? Thats one to have a bash at. Ditto greenguages and damsons. Oh, and happy new Year, to anyone persistent enough to get this far. In my 8 inch pan, even with trimming the pastry a little, it was too thick. If I were making it again, I'd make less pastry - maybe 20 per cent less. The amount of sugar in the pan is entirely in keeping, but the recipe could stand less sugar, and more balsamic and juice. That's purely a personal point - I'd like a more savoury dish. Posted by Keith at 1:39 p.m.